I didn’t waste anytime, went looking for him after a couple mediocre bites and drinks. I snapped the first chance and got the shot while letting him know: he’s the reason I got cable, no joke! (He thought that was a great story). Me: Could you please make it to ChubbyChineseGirl (CCG)? Andrew Z: You are ChubbyChineseGirl!? Andrew: Oh! We follow each other on Twitter! Most people see him as the guy who eats all sorts of weird things and though that is somewhat true, to me he really shows us the world through food. He is open minded when offered anything, anywhere, out of respect and curiosity. I love how something that could be “bizarre” for one, could be an everyday eat for another. It’s all about perception and environment. He connects us all in a more tangible and human way and I love that about the show. 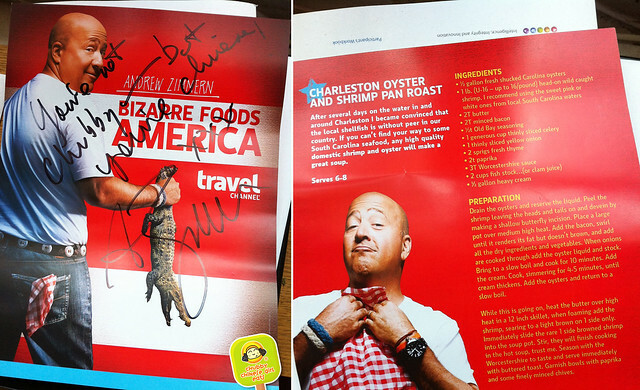 I’ve died and went to foodie heaven after this… thanks for being so cool Andrew! The rest of the Taste the UWS event was a blur. The joints that showed up were aight, nothing really stood out. And if this is what the UWS taste like, I would take the train downtown. My favorite Recipe nor other UWS favorites participated, but Shake Shack was there to sorta save the night. Luckily we arrived early. Lines were very manageable and the 6 of us did a divide and conquer before the whole place became a zoo. Since there was no line yet, we ran to M.Wells. I really miss them and find myself curing my withdrawals through their random appearances like their Foie Gras Poutine at Smorgasburg and meat pies at P.S.1. As we were ordering, the lady from the health department was inspecting, I was crossing my fingers and telling her to leave our foie gras alone in my head! In the end, she did. 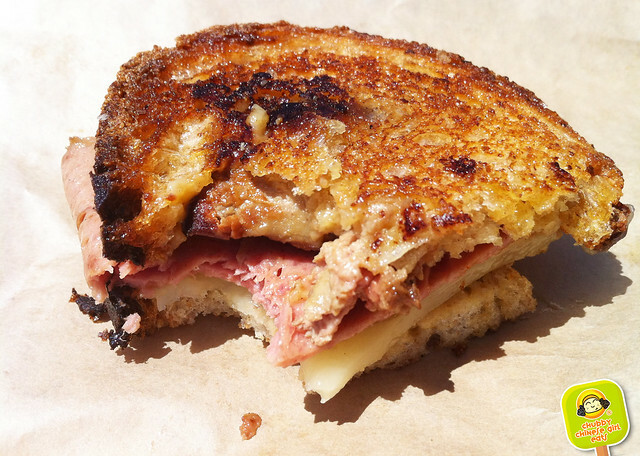 Horse Bologna & Foie Gras Grilled Cheese. Finally there it was… seriously not for the calorie conscious. 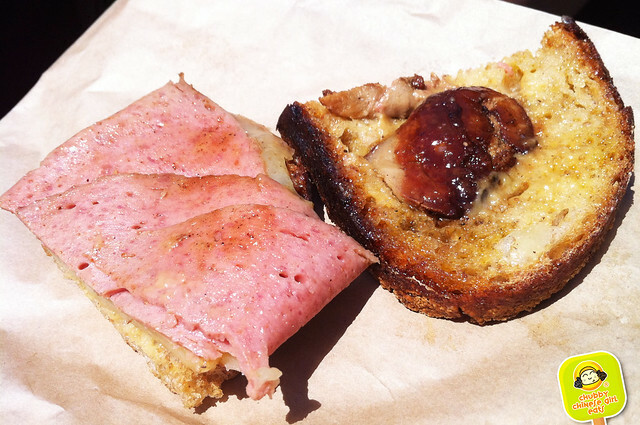 Rich and decadent foie gras, horse bologna (which isn’t too different from regular, I’ve had horse in Iceland and it just tastes like very lean meat) and cheese between to perfectly charred and buttery bread. 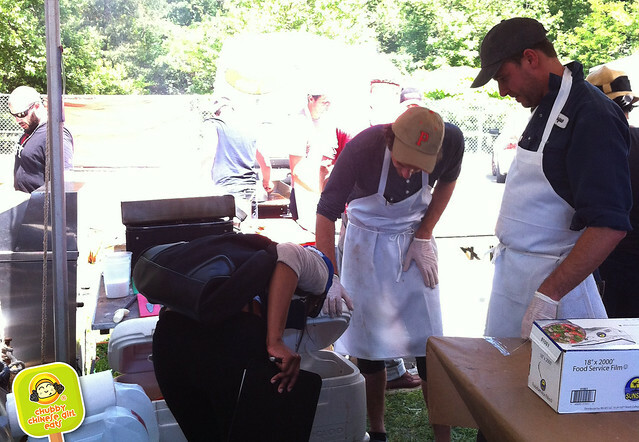 One of the high point of the day… This was the best and most unique thing we ate at the event. Top Left: Colicchio & Sons: Spit-Charred Pork Belly Tacos, at $6 each this was outrageously overpriced and not even hiding it. The tortilla was dry and hard. The pork was ok, but nothing to be raving about. Thumbs way down. At this profit margin, we will be sending Colicchio’s sons to college! 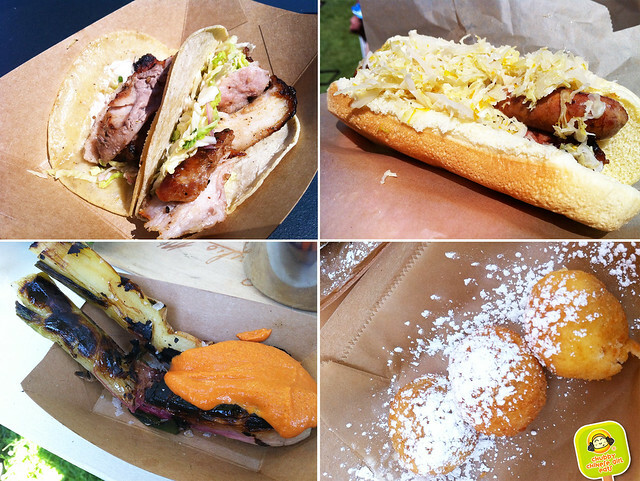 Top Right: Craft: Dirty Duck Dog was dry, I thought duck is fatty, but I guess they didn’t utilize that. The bun wasn’t toasted. The only saving grace were the nice lemon zest in the slaw (great idea). Bottom Left: Tia Pole: Spring Onions with Romesco Sauce was decent. At $3 each onion, it wasn’t exactly a deal. It was charred on the outside and very tender and sweet inside. The romesco sauce was addicting, I think you could dip anything. A little bit spicy, garlicky and savory with that sweet pepper note. Bottom Right: James: Fried Cheesecake Bombs were light and fluffy. They were $2 each!!! which has become a theme. But at least they were tasty. The chocolate ones were like a lava chocolate cake, but the ricotta lemon were a burst of bright citrus creamy goodness oozing out of the golden exterior. They were quite good just not sure if they were worth the dough. By mid afternoon it all turned into a mad house. Lines, lines, lines. Waiting, waiting and more waiting in the sun. The Foie Gras Doughnuts were SOLD OUT around 3pm or so. I wanted to give my tummy a break before getting it and missed out, though I’ve heard some mix reviews. I wanted to save Wooly’s last (not the best idea, they had the longest lines in the dessert section). After waiting for 40minutes or so for icy (well worth it on such a hot day) Wooly’s was running out of toppings, but because their ice is flavored with condensed milk, it didn’t really matter. I got the Mammoth size with strawberry syrup and mochi. It hit the spot like no other and it brought my friend W back to Taiwan. 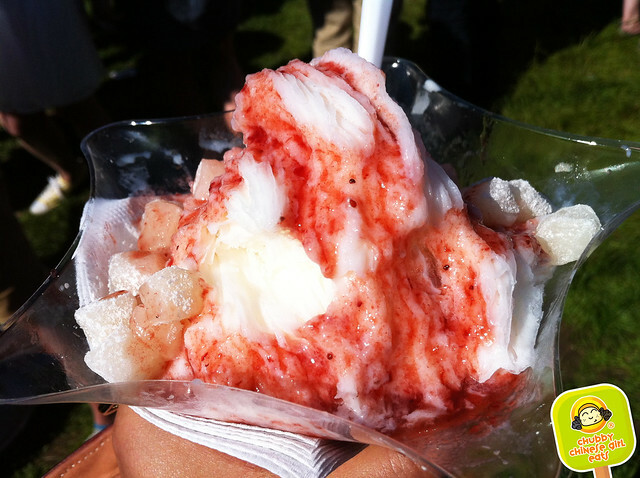 Their snow ice is just sooo good! Milky sweetness that melted away. Overall, the perfect weather sorta saved the day. 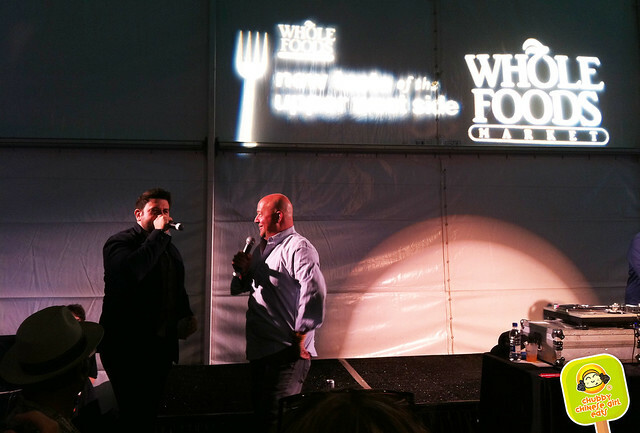 They advertised a lot of celebrity chefs, but that was only for the suckers, I mean people who spent $250 per person. We got most of the food we wanted to try, but for those that came late, each line was more than an hour long! Insane! And worst when they started running out. There was a line to get an I.D Check bracelet, a line to get drink tix and then to get drinks, so many steps for no reason. It wasn’t well organized and truthfully, because most of the participants are quite accessible by a subway ride, it really wasn’t that “special”. we went on Sunday which apparently was 100x better than sunday. foie doughnut was pretty interesting. glad to try, but never again, hahaha. Fun fun fun! 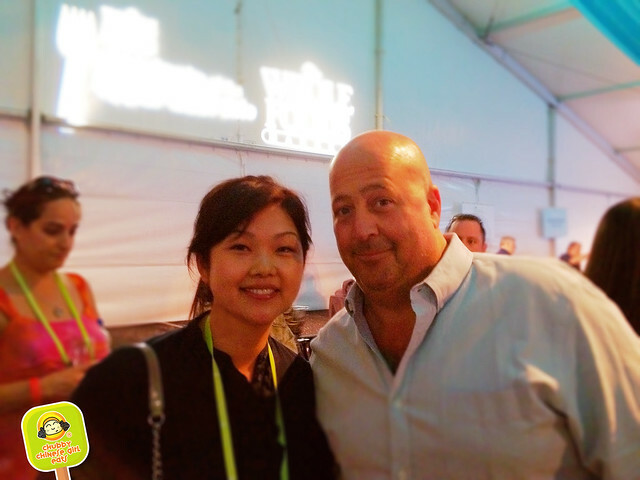 That’s so cool that Andrew Zimmern actually knows your blog! I totally remember the day you announced that, hee hee. I had the same sort of shock when I was introduced to James Oseland of Saveur magazine several months ago and he knew my blog! Cindy, thanks so much for stopping by Shake Shack at the Taste of the Upper West Side. We’re thrilled to be one of your top picks in the community. Hope we see you again soon! Brandy, you’ll def see me again and again and again! I’m addicted to your Shack Stack, Fries and Strawberry milk shake!!! TT I got mixed reviews about the doughnut… but would like to try it sometime!